Hopes of trading in the copy of Halo: Reach Xbox 360 system update testers are getting for participating flew out the window this morning, as these lovely warning covered Reach discs began arriving on testers' doorsteps. 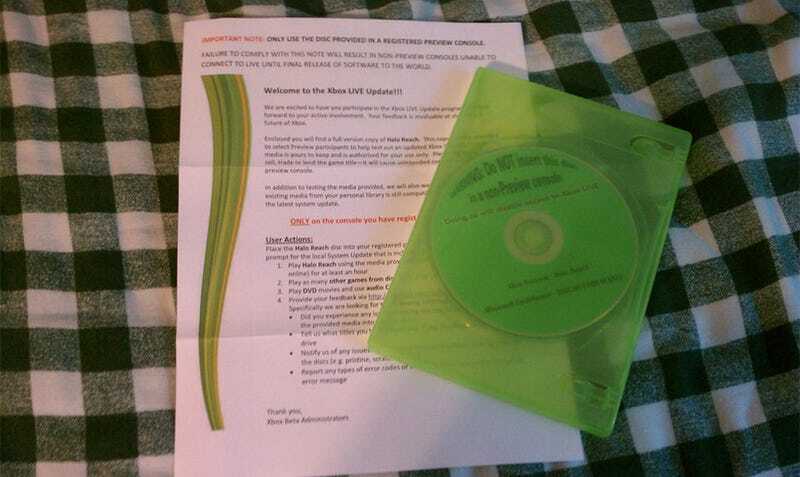 Several testers have sent us pictures of the mailings this morning, as the disc-based wave of the next Xbox 360 system update testing gets underway. From what we've heard there are two testing groups: One that is receiving discs, and another that is strictly doing things on a downloadable basis. Looking through the document, it seems like the system update is included on the Halo: Reach disc, which could explain the new disc format mentioned in the original testing announcement. It looks like Microsoft is testing the possibility of updating the system via games as well as the internet, much like the system already in place for Sony's PSP. Update: Apparently there have always been updates on the game discs, and I've never seen them because I am magic, or have never had my system disconnected from the internet long enough to require an update. If you didn't get into the test, there's no need to be green with envy. There's no way those copies of Reach will ever see the inside of a used game store.